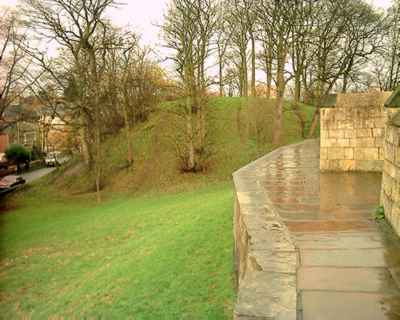 The Old Baile is an 11th century earthwork motte and bailey fortress, founded by King William I. One of two castles guarding the River Ouse and the Vale of York, the other being York Castle. Built in 1068, it was captured and destroyed in 1069 but by the 12th century its large circular motte, encased by a ditch, supported a range of timber buildings, encased by a palisade. Abandoned by 1322, when two sides the quadrangular bailey rampart were incorporated in the city wall. In the mid 17th century, Parliamentarian forces raised the height of the motte, to form a Civil War gun emplacement. The Old Baile is located in York, off Cromwell Road. 24 miles north-east of Leeds, on the A64-A1036. The site is visible from the city wall.